Waltz Me To Heaven: What's In Your Beach Bag? What's In Your Beach Bag? 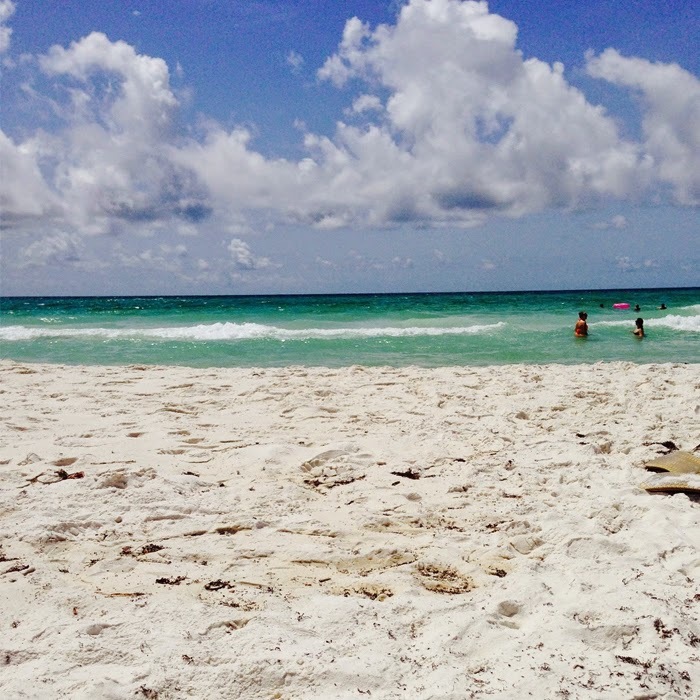 I am literally counting the minutes until school is out on Friday and we can head down to Seaside, FL, for Memorial Day weekend. Who knew the last day of school would be this exciting as a parent? Of course, two weeks into summer I know that I will be counting the minutes until my unruly children will return to school. Can't live with 'em, can't live without 'em! Let's start with skin care. I love a Neutrogena sunscreen for my face. Lately, I've been using the "pure & free baby" sunscreen, because it is the only one that doesn't bother my daughter's sensitive skin. I'm also a fan of good old Banana Boat for all over the body. I usually use the baby sunscreen, because there is nothing worse than a crying kid at the beach with sunscreen in his eye. I'm pretty thorough when I put it on the kids, and as long as I can get them to stand still, they never burn. For post-sun lotion, I also use Banana Boat. I know there are more expensive ones out there, but I've been using this since I was 13, and it has always kept my skin soft and moisturized. Once we head up from the beach, I love Neutrogena's "Deep Clean Scrub" to wash all that sunscreen off my face. It is oil-free, and as a little bit of an exfoliant in it. I used to use a NARS face scrub, and I swear this is exactly the same without the sticker-shock. For my daily moisturizer, I like Clinique's "even better skin tone correcting moisturizer." Again, it is oil-free and does not get heavy as the day progresses, plus it helps even out any sun damage you might get. Finally, when the kids are in bed and the day is done, I use Estee Lauder's Advanced Night Repair. I learned about the product from my mom, who has naturally beautiful, ageless skin. So, these are my picks, and they are what I actually use. What are some of your favorite skin-care products? Waltz Me To Heaven is part of affiliate marketing programs, which means if you click a link on our blog, we may or may not earn a commission. My oldest son got my husband's fair skin, and he burns! I have to be so careful with him - sunscreen, hat, rash guard! It's funny because he's the one with dark hair, while my blondie got my yellow skin, and we tan. Love this! Neutrogena is by far my favorite sunscreen! Love that it's not super greasy! I've been using Neutrogena lately and love it! I'm also heading to the beach this weekend for the long weekend and my beach bag is already packed with different sunscreens! I haven't trued any of recommendations tho except neutrogena. What are you taking? I always like to hear what works for other people! I am so jealous that you are headed to Seaside! It's one of my favorite beaches In Florida. I hope you have an amazing trip. These are great picks, and good for you for taking such good care of your skin! Ohh so jealous of your Memorial Day trip! Im hoping to get to the beach this weekend too. Sunscreen is a definite must have! Especially in FL! If only I lived near the beach!